Bigger impact. More response. Significant results. What is a brand? A brand connects verbal and visual elements to create recognition, reach targeted audiences, and build a total experience. Then what is brand optimization? It’s a narrowly focused, carefully positioned brand crafted to connect with specific audiences, when and where they’re looking for what you offer. An optimized brand presents key messages and vivid images at the precise point when and where your target is choosing to respond — to inquire, join, refer, click through, sign up, enroll or buy — the critical point of choice. 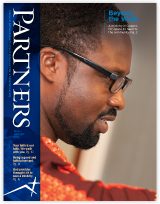 For Church Extension Plan, a financial ministry, an optimized brand reaches multiple audiences through their magazine (shown), website, direct mail, email and conferences. The brand design is quickly recognized. Messages and visuals capture attention and entice response. The unique value and benefits are easily understood. Consistency unifies the visual and verbal brand. The program is easy to implement and manage. An optimized brand rises above the chaos and creates a connection. We work from your audiences’ perspective and the critical points of choice. We connect both online and offline tactics to draw people in and move them to the next action. Each element of brand optimization is fine-tuned to what you stand for; what audiences can count on; what they care about; and where they learn about what’s offered. Products leap off the shelf. Leads surge. Sales numbers swell. Enrollment expands. Patients choose. Members join. People talk. Business accelerates. Results multiply. What is the point of choice and why is it so important?